(March 11, 2019 – Boston, Mass.) A team of industry veterans headed by Robert Pojasek, Ph.D and Art Stewart, MPM are delivering a suite of integrated capabilities that improve the management of uncertainty, build greater resilience, and develop new business opportunities for Preferred Suppliers facing ethical trade audits by their major sourcing company customers – and increasing scrutiny from external third parties. Read the full announcement here. Download Capabilities Overview. (February 1, 2017.) SIP team members Brian Cunningham, Jeff Leinaweaver, and Art Stewart presented a one-hour webinar examining three trends that are driving a transformation of corporate responsibility (CR) practice to a new operations-centric model. The webinar, produced in partnership with the Corporate Responsibility Association, was originally presented live on Wednesday, January 18. CR is maturing and morphing into uncharted areas at a rapid pace. Responsible business standards and practices are becoming part of the solution criteria for a host of increasingly complex challenges resulting from a dramatically shifting context for global supply chain operations, enterprise risk management, Board governance, C-suite leadership, human capital enablement and culture development. (June 1, 2016.) 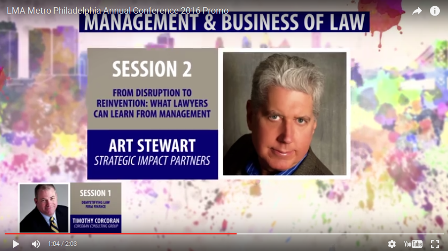 SIP Managing Director Art Stewart will present a workshop at the Second Annual Education Conference offered by the Legal Marketing Association (LMA), Metro-Philadelphia Chapter. The full-day event will take place in Philadelphia on July 18 and is expected to draw some 150 participants – including Chief Marketing Officers, Directors of Business Development, Events Managers, Project, Pricing and Marketing Operations Managers at leading law firms as well as service providers to the legal marketing industry. (May 26, 2016.) 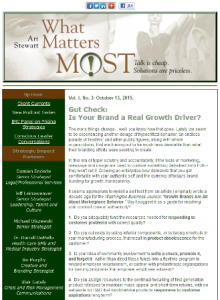 Strategic Impact Partners has published the latest edition of our E-Letter,"What Matters Most!" Among the topics covered is the 19th Annual Global CEO Survey, "Redefining Business Success in a Changing World." The findings indicate that global CEOs are awakening to purpose and responsibility values as strategic assets for enhancing business competitiveness. Read the full edition here. (March 2, 2016.) Strategic Impact Partners Managing Director Art Stewart and Senior Strategist Jeff Leinaweaver will deliver a workshop as part of the program for the annual Spring Symposium of the Supply Chain Management Institute at the University of San Diego in April. The Symposium convenes Wednesday, April 13 and concludes the following evening, April 14. Stewart and Leinaweaver will present their 90-minute session for attendees on Thursday. The session, Global Supply Chains as the Next Frontier in Corporate Responsibility, will provide a snapshot of the current global responsibility movement in the context of its transformation of supply chain strategy, operations, and social responsibility. The interactive workshop will also look at how sustainability practices are transforming management systems – particularly human rights issues and the global supply chain. Nearly 200 supply chain professionals, representing a diverse range of leading brands and industries, are expected to attend. Other speakers presenting include leaders from Southern California Edison, Callaway Golf, Tesla Motors, Mattel, Barco Uniforms, Tranzact Technologies, ParadoxSolve and the University of San Diego, among others. (November 1, 2015.) ArtStewart will participate on a panel examining current best practices to do with pricing strategies for professional services firms, particularly management consultants, at the November 13 breakfast meeting of theInstitute of Management Consultants, Philadelphia Chapter. The panel will lead a dynamic and interactive discussion on the pros and cons of the various types of professional services pricing, such as fixed fee, time and material, contingency and retainer based fees. The audience of colleagues will be invited to join in the discussion covering a range of issues, including which form of pricing is appropriate for certain clients and what is the sound basis for calculating a base budgeted rate. "How organizations look at risk and crisis management is constantly evolving. It’s critical to have a business preparedness and continuity plan. Not only will it help you plan for a disaster, but it will also protect the safety of your employees and maintain customer service. More and more, public-private partnerships are enhancing all aspects of emergency management: preparedness, protection, response, recovery and mitigation. Information sharing, emergency planning, communications and resource sharing are core to all of it."